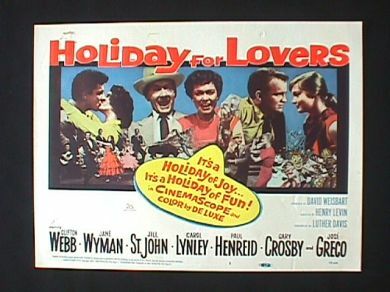 HOLIDAY FOR LOVERS , pastiched together by director Henry Levin in 1959, from a slew of second-unit location shots and fooling-nobody rear projections of the woe-is-they cast against same, is supposed to be a comedy. I rather enjoyed it as a kid (on ABC’s Sunday Night at the Movies), but I can see now that was merely out of defiant loyalty to Clifton Webb over his memorable work with Barbara Stanwyck in Titanic. The 69-year old actor, popular for roughly a decade despite/due to his haughty imperious mien (now plainly recognized as “bitchy queen”) was on the career downslope in this treacle about a family vacationing in South America to check up on their elder daughter’s escapades. The horizon-flat script would be handicap enough, giving likewise fading pros Jane Wyman and Paul Henreid thankless character holes to somehow fill in, but then to drop the lead weight known as Jill St.John on top of it—-alone enough to reverse the flow of the Amazon with her peerless inability to ever say a line like an actual real-life person—and for sheer punishment then inflict 99% charm-free Gary Crosby (ill-suited, ill-fated, ill-looking)—what mogul mischief was at work? St.John, reputedly I.Q.’d at 162, had curves, married money (repeatedly) and knew how to play the game because other than a few eye-candy bikini breaks in campfests like Tony Rome and The Oscar, her ‘acting’ torpedoed every feature she appeared in. One can image the fey, theater-trained, twice Oscar-nominated Webb fighting back a bodily impulse to have a stroke while sharing a scene with the 19 year old ‘sensation’.